Russia's Laurissa Poling shoots during the District Nine Division IV girls all-star game on Thursday at Troy's Trojan Activities Center. Houston's Hayden Riesenbeck drives during the District Nine Division IV girls all-star game on Thursday at Troy's Trojan Activities Center. Botkins' Taira Greve drives during the District Nine Division IV girls all-star game on Thursday at Troy's Trojan Activities Center. Houston’s Jess Monnier shoots during the District Nine Division IV girls all-star game on Thursday at Troy’s Trojan Activities Center. Riverside's Lane Willoby shoots during a District Nine Division IV boys all-star game on Thursday at Troy's Trojan Activities Center. Lehman Catholic's Bryce Kennedy and Russia's Daniel Kearns chase a loose ball during a District Nine Division IV boys all-star game on Thursday at Troy's Trojan Activities Center. Botkins' Spencer Heuker takes a shot during a District Nine Division IV boys all-star game on Thursday at Troy's Trojan Activities Center. 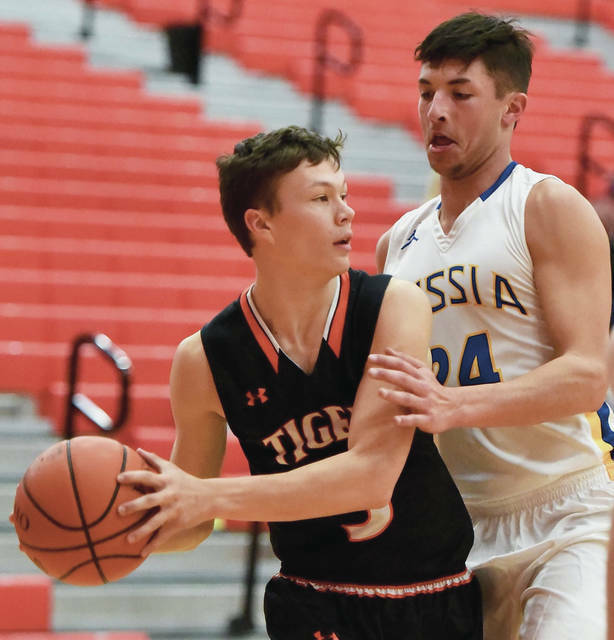 Jackson Center’s Trent Platfoot looks to get around Russia’s Daniel Kearns during the District Nine Division IV boys all-star game on Thursday at Troy’s Trojan Activities Center. Russia's Jordan York drives during a District Nine Division IV boys all-star game on Thursday at Troy's Trojan Activities Center. Russia’s Laurissa Poling shoots during the District Nine Division IV girls all-star game on Thursday at Troy’s Trojan Activities Center. Poling will play volleyball at Wright State. 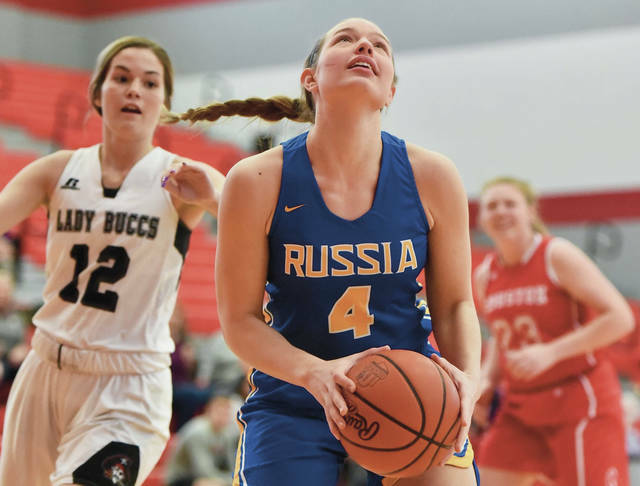 TROY — Laurissa Poling’s name will be all over record lists for Russia’s volleyball and basketball programs when she graduates in about two months. Her lore in the small town will only grow when she reaches Wright State’s campus in Fairborn next fall. Poling, a two-time all-Ohio honoree in both sports, will be one of few Russia graduates to play Division I collegiate athletics when she walks on with Wright State’s volleyball team. Her prep basketball career was as successful as her volleyball career. She capped off her hoops playing days on Thursday in the District Nine Div. IV girls all-star game by scoring 21 points and bringing down 10 rebounds. It’s the second all-star game Poling has played in during the last week. She also played in Jim Dabbelt’s Dayton Seniors all-star classic last Friday at Bethel High School. Poling, a senior, was named Div. IV second team all-Ohio in volleyball last season and was named honorable mention all-Ohio in basketball each of the last two seasons. She was also an all-state honorable mention selection in volleyball as a junior. Poling scored 945 points in her career and had 695 rebounds. 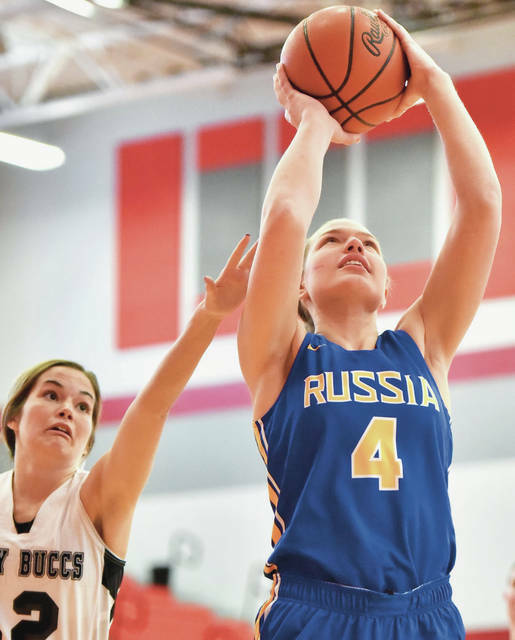 She averaged 12.1 points and 6.2 rebounds per game as a senior while seeing much more defensive pressure from opponents as a result of Russia’s losses to graduation from the previous year. Poling had 296 kills, 89 blocks and 33 aces for Russia last volleyball season. She is the school’s all-time career blocks leader and is second in kills. Poling, who plans to major in a medical field, said she had scholarship offers from smaller schools but was looking at Wright State anyway in case she didn’t play collegiate sports. She said an opportunity to walk on with the school’s volleyball team sealed the deal. She may earn a scholarship in future years. Poling was one of five area players that played for the East team in Thursday’s game. The squad was shorthanded, as only half the players scheduled to play in the game were in attendance. The West squad had nearly all its roster on hand and pulled away late to an 81-66 win. 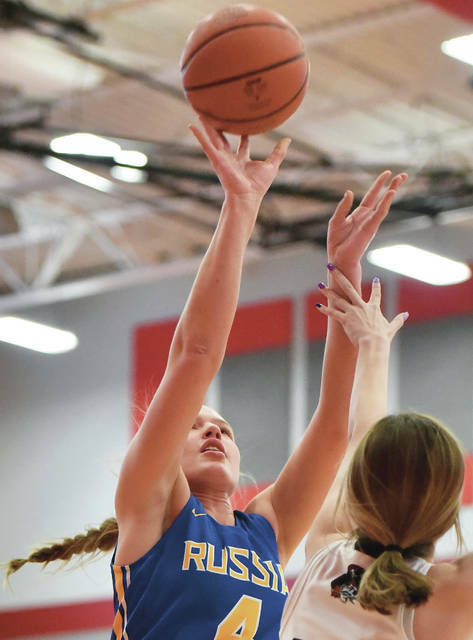 After taking a big early lead, the East pulled within one point midway through the first half on a 3 by Fairlawn’s Lauren Dudgeon and later took a one-point lead late in the half on a 3 by Tri-Village’s Emma Printz. Printz later hit a 3 to give the East a 46-45 lead in the second half, but the West pulled away from there. Dudgeon finished with nine points. 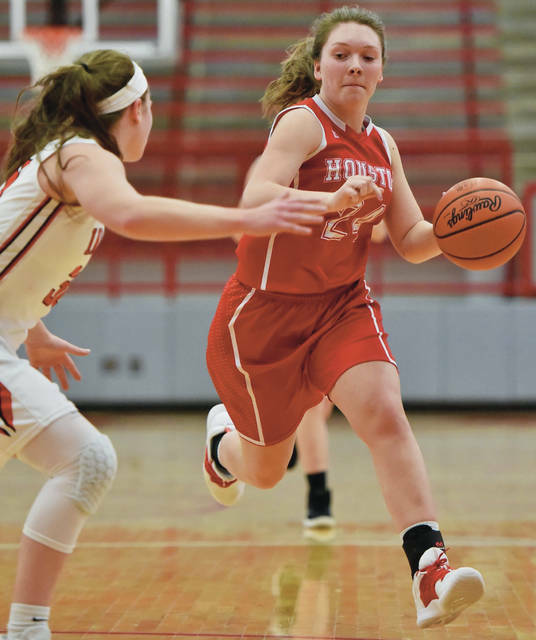 Houston’s Jess Monnier scored seven and Hayden Riesenbeck scored three. Botkins’ Taira Greve scored one. Tri-Village’s Emma Printz led the East with 27 points. Covington’s Sammi Whiteman, who was named the state’s Div. IV player of the year, led the West with 31. Several players did well in the D-IV boys all-star game. 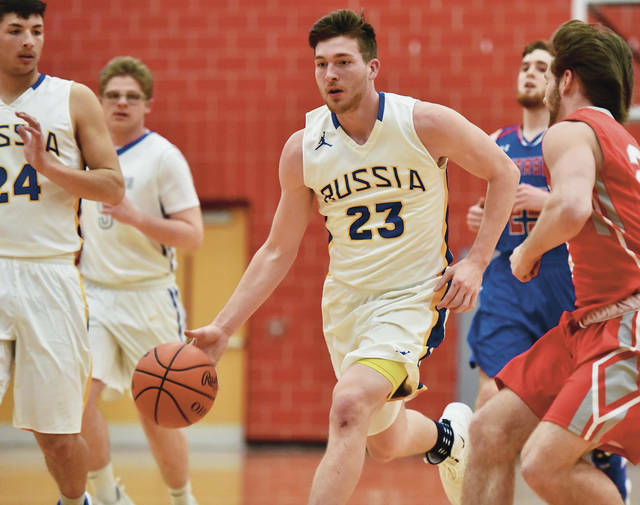 Russia’s Jordan York scored 22 points for the West, which won 124-113 in a high-flying game that featured a ton of dunks, trick shots and deep 3-pointers. Daniel Kearns added nine points and Lehman Catholic’s Bryce Kennedy scored 12. Jackson Center’s Trent Platfoot scored seven for the East team, as did Botkins’ Spencer Heuker. Riverside’s Lane Willoby scored six. Friday’s Div. I/II/III girls game will be at 6:30 and the boys will follow at 8. Sidney’s Andre Gordon and Ratez Roberts are slated to play in the boys game, as is Xenia’s Samari Curtis, who was named Mr. Basketball last week. All profits from Thursday and Friday’s games will be donated to Dayton Children’s Hospital. Russia’s Laurissa Poling shoots during the District Nine Division IV girls all-star game on Thursday at Troy’s Trojan Activities Center. https://www.sidneydailynews.com/wp-content/uploads/sites/47/2019/03/web1_DSC_1686-1.jpgRussia’s Laurissa Poling shoots during the District Nine Division IV girls all-star game on Thursday at Troy’s Trojan Activities Center. Houston’s Hayden Riesenbeck drives during the District Nine Division IV girls all-star game on Thursday at Troy’s Trojan Activities Center. https://www.sidneydailynews.com/wp-content/uploads/sites/47/2019/03/web1_DSC_1832-1.jpgHouston’s Hayden Riesenbeck drives during the District Nine Division IV girls all-star game on Thursday at Troy’s Trojan Activities Center. Botkins’ Taira Greve drives during the District Nine Division IV girls all-star game on Thursday at Troy’s Trojan Activities Center. 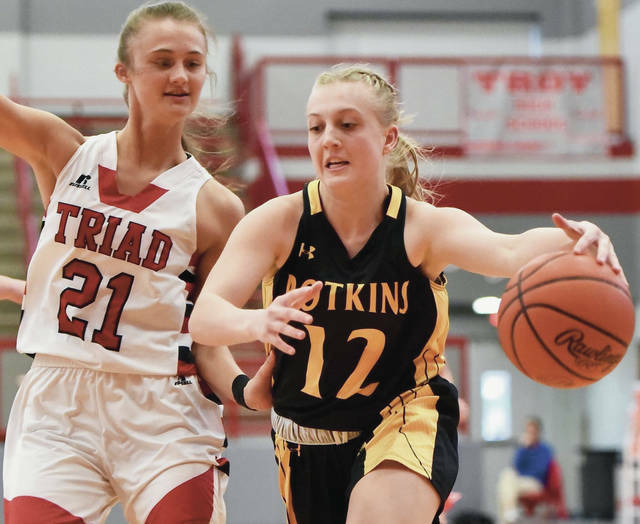 https://www.sidneydailynews.com/wp-content/uploads/sites/47/2019/03/web1_DSC_1729-1.jpgBotkins’ Taira Greve drives during the District Nine Division IV girls all-star game on Thursday at Troy’s Trojan Activities Center. 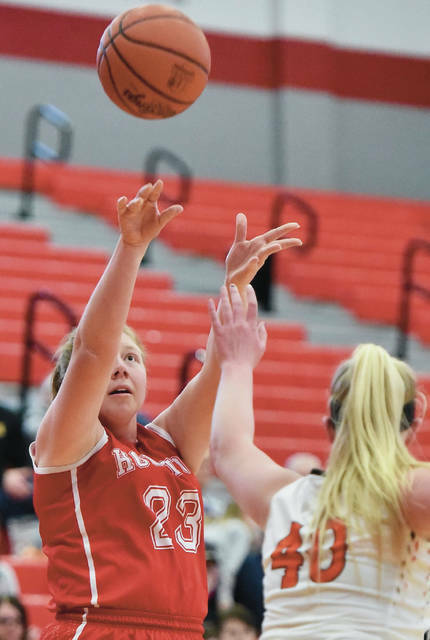 https://www.sidneydailynews.com/wp-content/uploads/sites/47/2019/03/web1_DSC_1896-1.jpgRussia’s Laurissa Poling shoots during the District Nine Division IV girls all-star game on Thursday at Troy’s Trojan Activities Center. 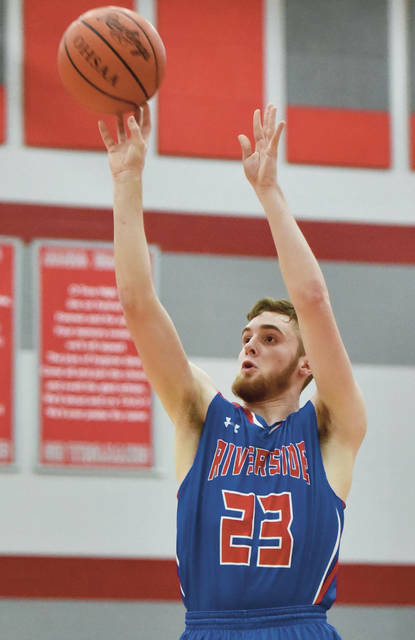 Riverside’s Lane Willoby shoots during a District Nine Division IV boys all-star game on Thursday at Troy’s Trojan Activities Center. Lehman Catholic’s Bryce Kennedy and Russia’s Daniel Kearns chase a loose ball during a District Nine Division IV boys all-star game on Thursday at Troy’s Trojan Activities Center. 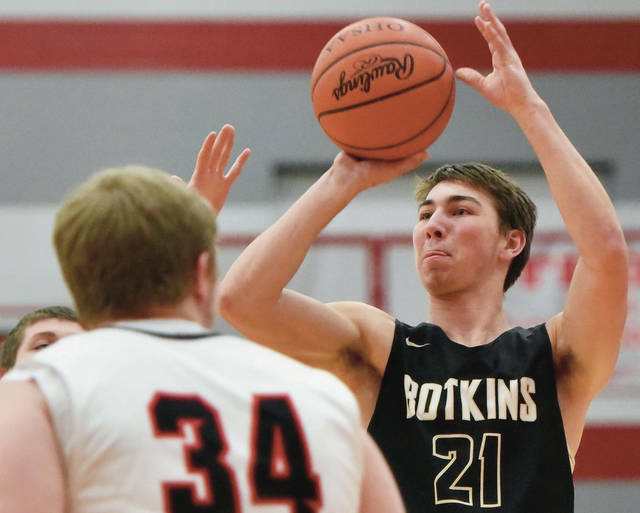 Botkins’ Spencer Heuker takes a shot during a District Nine Division IV boys all-star game on Thursday at Troy’s Trojan Activities Center. 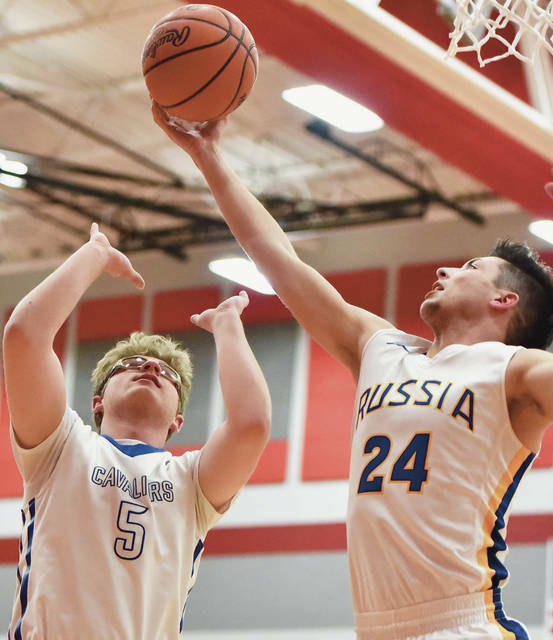 Russia’s Jordan York drives during a District Nine Division IV boys all-star game on Thursday at Troy’s Trojan Activities Center.